« WALNUTS & KALE LOVE ME–AND YOU TOO! I’ve often been asked whether it’s necessary to soak nuts before eating them. Is soaking a waste of time or does the process offer nutritional benefits? I thought it would be helpful to provide both views and let people decide what works best for them. 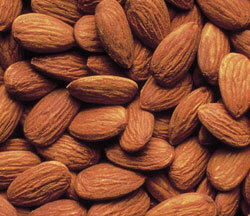 Frequently raw fooders soak nuts in preparation for assembling a recipe like nut milk, nut butter, or nut cheese. 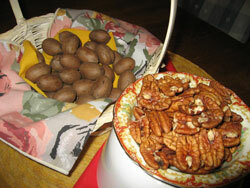 Soaking makes nuts softer and creamier and enhances the texture of many raw dishes. I’ve provided a section in my cookbook, The Nut Gourmet, that covers soaking nuts, but this fun and informative blog gives me the opportunity to share the simple process with anyone searching for this information on the internet. 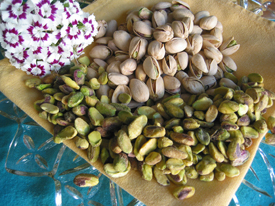 Soaking nuts offers several health benefits. The simple process of soaking nuts for several hours works like magic to increase their antioxidant and phytochemical capacity because soaking releases some enzyme inhibitors. 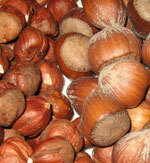 Some people have difficulty digesting nuts and eliminate them from their diet. They needn’t miss out on the healthful benefits nuts offer because a few hours of soaking does wonders—Soaking is the prelude to the sprouting process and releases enzymes that inhibit the digestibility of nuts. Soaking nuts also helps to break down their macronutrients. Protein, fats, and carbohydrates are broken down into digestible components, turning protein into free flowing amino acids, fats into fatty acids, and carbohydrates into simple sugars, essentially predigesting them. After soaking for several hours, nuts become very soft and lose their crunchiness. To return them to their natural crispness, dry them with paper towels or a kitchen towel and dehydrate them for several hours at a temperature between 110 and 115 degrees F. Alternatively, you can roast them in the oven. To preserve their valuable vitamin E and antioxidant flavonoid and polyphenol contents, place the nuts on a baking sheet and dry roast them at 150 to 170 degrees F. for 15 to 20 minutes. Transfer the nuts to a dish to cool, and taste their exceptional flavor and pleasantly crisp texture. Not everyone has problems digesting nuts. For those who do, soaking is definitely helpful. However, soaking adds to extra steps before one can actually eat the nuts. In today’s busy world, few of us are looking for extra processes in order to prepare our foods. I’m a from-scratch cook, but I, too, shun extra steps when they’re not needed. For most of us with the ability to digest nuts without difficulty, we can reap the multitude of health benefits of eating nuts raw or roasted without soaking. Mother Nature has made a perfect ready-to-eat food that’s packaged in protective shells. Within those protective shells are a storehouse of minerals, heart healthy vitamin E, fiber, protein, and a mountain of antioxidants and phytochemicals. Nuts are a healthy, nutrient dense food that studies have shown to reduce the risk of heart disease when eaten in small quantities like one to two ounces daily. Fortunately for us busy folks, nut processors have also saved us the labor by shelling the nuts and putting them into convenient packages. Nuts are freshly harvested in the fall and are so much tastier and moist than they are by the end of summer. For the holidays, I like to buy a variety of fresh nuts in the shell and put them in a bowl with several nutcrackers. Guests who visit my home during fall and winter have one nut-cracking good time and enjoy a heart-healthy, highly nutritious treat in the process. This entry was posted on September 7, 2011 at 7:20 pm	and is filed under Antioxidants in Nuts, Nut Nutrition, Nut Uses, Nuts and Health. Tagged: benefits of soaking nuts, crisping soaked nuts, enzyme inhibitors in nuts, increase antioxidants in nuts, low temperature roasting nuts, make nuts more digestible, necessary to soak nuts, nuts' digestibility, soaking nuts. You can follow any responses to this entry through the RSS 2.0 feed. You can leave a response, or trackback from your own site. I just returned to the city of New Yok after a wonderful visit to my real home in Louisiana where I helped with my dad’s pecan harvest. How good they are! I brought back a bag of shelled and a bag of cracked. Thanks daddy. Thanks for the really informative and helpful presentation on “why soak nuts?”. I have read about it in a number of places and have actually been doing it for the past several weeks (has worked especially well for me with walnuts @ 4 hours and almonds @ 7-8 hours) but no one has covered it as well as you. Appreciate it! Thanks so much for providing a very simple & candid explanation on the benefits of soaking nuts. I just made my first batch of roasted, salty sweet & crunchy almond butter. I was getting confused with the many e-articles and Y Tube videos on whether or not I was losing out on the health benefits by choosing not to presoak the almonds before roasting them. Now I totally understand thanks to your extremely clear commentary. Hi Genie, I’m so delighted the information on soaking nuts was helpful. There are many believers one way or the other, but I did consult the expertise of registered dieticians Brenda Davis and Vesanto Melina, who had done a great deal of research for their book Becoming Raw: the essential guide for raw vegan diets. Drop in often to find all sorts of nut-related and even nutty posts for education and pleasure.